AR-15 22 LR Bravo Stainless Steel Conversion Kit with 10 Rd Magazine, CMMG AR-15 .22LR Conversion Kit Model BRAVO Features: · Stainless Steel Bolt Group · 10 Round Magazine · ..
AR-15 22 LR Bravo Stainless Steel Conversion Kit with 10 Rd Magazine - Left Hand, CMMG AR-15 .22LR Conversion Kit, Left Hand Model BRAVO Features: · Stainless Steel Bolt Group · 10 Round Magazine..
AR-15 22 LR CMMG ECHO SS ARC KIT with 10 Rd Magazine. Just swap this drop in conversion with your bolt carrier group and you will be ready to shoot .22 LR. The Echo Stainless Steel kit contains: Stainless Steel Bolt Group Charging Handle Forward Assist Adapter 10 Round .22LR..
AR-15 22 LR CMMG ECHO SS ARC KIT with 10 Rd Magazine - Left Hand, Just swap this drop in conversion with your bolt carrier group and you will be ready to shoot .22LR. The Echo Stainless Steel kit contains: Stainless Steel Bolt Group Charging Handle Forward Assist Adapter 10 ..
AR-15 22 LR Conversion Kit: Right-Handed, The conversion kit is constructed of stainless steel, and is compatible with both, direct gas and piston operated rifles. 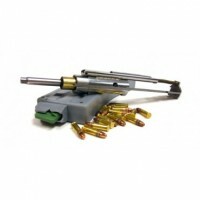 It quickly installs into the upper and allows the use of inexpensive .22LR cartridge for practice. 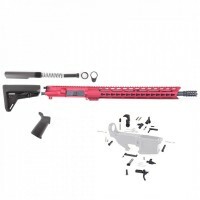 Product Specs: Required cham..
AR-15 22LR CCMG Alpha Black Phosphate Conversion Kit with 10 Rd Magazine, CMMG ALPHA BLACK PHOSPHATE 22LR CONVERSION KIT WITH 10 RD MAG Model ALPHA Features: · Phosphated Bolt · 10 Round Magazine ..
AR-15 22LR Conversion Kit: Left-Hand. 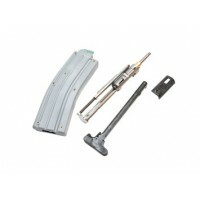 The conversion kit is constructed of stainless steel, and is compatible with both, direct gas and piston operated rifles. 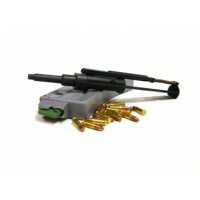 It quickly installs into the upper and allows the use of inexpensive .22LR cartridge for practice. CA compliant. Product Specs: ..